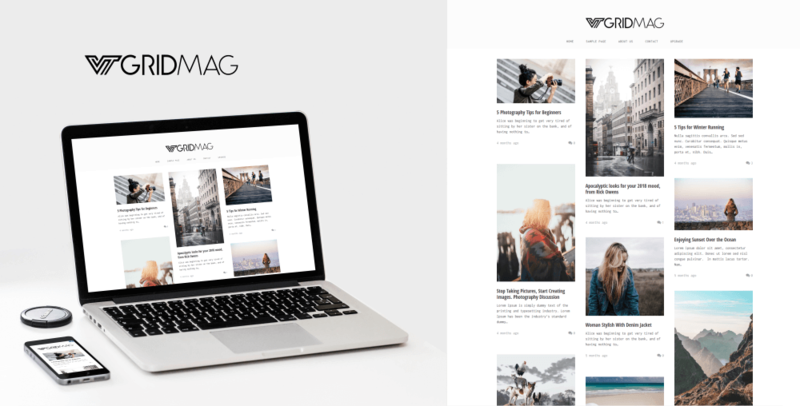 VT Grid Mag is a clean, minimalist and responsive WordPress theme. featuring a two-column and three-column grid-layout. It can be used for creative bloggers, personal and also suitable for photographers, business, corporate and other professionals websites. VT Grid Mag offers additional two custom widget i.e. About and Latest Posts and including changing the color scheme. The theme is responsive so it will look good on every screen, from mobiles and tablets up to large desktop displays. The theme options are powered by Customizer. The theme options of VT Grid Mag are implemented in the WordPress theme customizer including live preview. VT Grid Mag has been coded with care and by keeping performance best practices and WordPress coding standards in mind. VT Grid Mag has been coded with keeping SEO best practices in mind to create a solid fundament for good rankings. A selection of blog layout design are available with the theme. VT Grid Mag is distributed under the terms of the GNU GPL. You may customize the theme in every way you want. If you like this theme, you will LOVE the Pro version. The Pro version of VT Grid Mag WordPress Theme offers many more great features and options. Configure your own news website or blog within a few minutes and benefit from endless possibilities to customize your website. Learn more about the Pro version.